Tamarind seeds or Kernel is a byproduct of tamarind pulp industry. Tamarind gum is obtained from endosperm of seeds of the tamarind tree, which is a seed gum with potential industrial applications. Gums and Mucilages are polysaccharide complexes formed from sugar and uronic acid units. They can absorb large quantity of water and swell. They find wide range of pharmaceutical applications that includes their use as binder, disintegrants in tablets, emulsifiers, suspending agents, gelling agents and also used as sustaining agents in tablets.1 Synthetic hydrophilic polymers are used more often than natural polymers, but because of cost associated with synthetic polymers, researchers are now showing interest in natural polymers (Non-Synthetic) such as gums. Tamarind (Tamarindus Indica L.) is amongst the most common and commercially important, large evergreen tree that grows abundantly in dry tracks of central and south Indian states, also in other south east asian countries. The pulpy portion of fruit is mainly used as acidulant in Indian receipes.2 Tamarind seeds or kernel is a byproduct of Tamarind pulp industry. Tamarind gum is obtained from endosperm of seeds of the tamarind tree, which is a seed gum with potential industrial applications. Tamarind gum or tamarind kernel powder came into commercial production in 1943 as a replacement for starch in cotton sizing in Indian textile market.3 It is also used in microbial production of lipids.4 It is an important sizing material for textile, a good creaming agent for concentration of rubber latex used as a soil stabilizer, a rich source of proteins and amino acids.5 Moreover tamarind kernel powder may also be used as a feed for cattle and pigs.6 It is also used as food ingredient.7 Currently purified and refined tamarind kernel powder is produced and permitted in Japan as a thickening, stabilizing and gelling agent in the food industry.5 Gum solution of good adhesive strength from tamarind gum and sisal fibers were prepared which have potential industrial applications such as for false roofing and room partioning.8Tamarind gum is used as a creamer for latex, in explosives, in borax printing and paper manufacturing. It is also used as stabilizer in ice creams and as an emulsion textile paste. Thus tamarind gum is having applications in paper, food, textile industry etc. Recent years research has been initiated on the use of tamarind gum in pharmaceutical and cosmetic applications. This review specifically focused on pharmaceutical overview of tamarind gum. Polysaccharide present in tamarind kernel powder is called as tamarind seed polysaccharide. Tamarind seed polysaccharide is having molecular weight 52350 units and monomer of glucose, galactose and xylose in molar ratio of 3:1:2.18 Various methods have been reported for isolation of tamarind seed polysaccharide from tamarind kernel powder.19, 20 It is insoluble in organic solvents and dispersible in hot water to form a highly viscous gel such as mucilageneous solutions with a broad pH tolerance and adhesivity.21 In addition it is nontoxic and nonirritant with haemostatic activity.22 Recently tamarind seed polysaccharide is widely used for pharmaceutical applications. 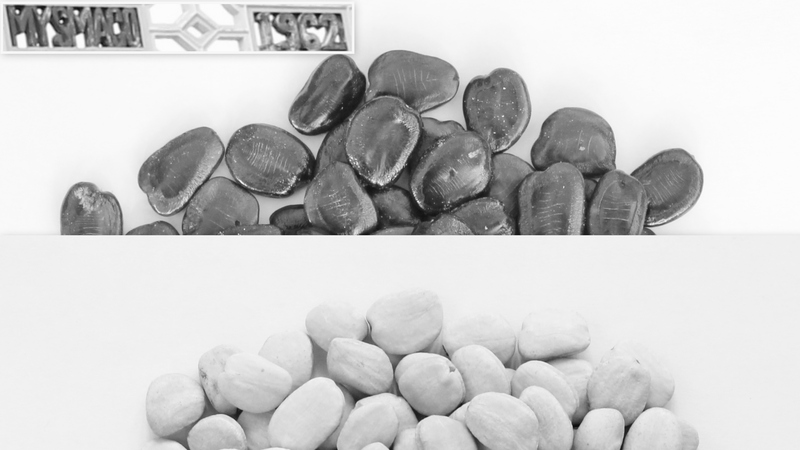 Tamarind seed polysaccharide was used as release modifier for the preparation of diclofenac sodium spheroids using extrusion spheronization technique with microcrystalline cellulose as spheronization enhancer. It was found that release was sustained over a period of 7.5 hour. A credible correlation was obtained amongst swelling index, viscosity, and surface roughness of the polysaccharide particles and in vitro dissolution profile of spheroids. In the comparative bioavailability study the developed spheroids have able to sustained drug release and also was found to improve the extent of absorption and bioavailabillity of drug. 1)Kulkarni GT, Gowthamarajan K, Brahamajirao, Suresh B. Evaluation of binding properties of selected natural mucilages. J Sci Ind Res. 2002; 61: 529-32. 2)Shankaracharyan B. Tamarind-Chemistry, technology and uses: A critical appraisal. J Food Sci Technol. 1998; 35(3): 193-208. 3)Gerarad T. Handbook of Water soluble gums and resins. New York : McGraw Hill; 1980, Chapter 23. 4)Jambhulkar V, Shankhapal KV. Effect of minerals on lipid production byRhizopus nigricans and Penicillium nigricans on tamarind kernel powder. J Food Sci Technol. 1992; 29: 333-35. 5)Glicksman M. Tamarind seed gum in food hydrocolloids. Florida CRC Press. 1986; 3: 191-202. 6)Reddy DV, Prasad DA, Reddy BS, Charyulu EK. Effect of replacing maize with tamarind seed on rice polish on the performance characteristics and nutrients utilization by desi pigs. Indian J Animal Sci . 1986; 10: 118-22. 7)Forest Research Institute. Tamarind seed has many uses. Indian Farming 1955; 5(8):21-22. 8)Veluraja K, Ayyalnarayanasubburaj S, Paul Raj AJ. Preparation of gum from tamarind seed and its application in the preparation of composite material with sisal fibre. Carbohydr Polym. 1997; 34(4): 377-79. 9)Bose SM, Subramanian N. Bull Cent Food Technol Inst. 1954; 3: 66. 10) Shrivastava HC, Singh RP. Structure of polysaccharide from tamarind kernel. Carbohydr Res. 1967; 4: 326-42. 11) Kooiman P. Rec Trav Chim Pays-Bas. 1961; 80: 849. 12) Rao P. S. Shrivastava HC. Industrial Gums . 5th ed. New York : Whistler RC; 1973. 13) Rao KH, Subramanian N. Protein foods feeds. Proc Matt Symp. 1984; A67-A87. 14) Bhattacharya S, Bal S, Mukharjee RK, Bhattacharya S. Rheological behavior of tamarind kernel powder suspension. J Food Eng. 1991; 13: 151-58. 15) Babu GV, Gowrisankar V, Himasankar K, Murthy KV. Studies on applicability of tamarind kernel powder as a carrier in the dissolution enhancement of poorly water soluble drug celecoxib. Boll Chim Farm. 2003; 142(2): 76-82. 16) Nakamura Ota R, Machid Y, Nagai T. In vitro in vivo nasal mucoadhesion of some water soluble polymers. Int J Pharm. 1996; 134: 173-181. 17) Takahashi Y, Takeda C, Seto I, Kawano G, MarindaY. Formulation and evaluation of Lactoferin bioadhesive tablets. Int J Pharm. 2007; 343: 220-227. 18) Khanna M, Nandi RC, Sarin JP. Standardization of Tamarind seed powder for pharmaceutical use. Ind Drugs. 1997; 24: 268-69. 19) Takashi T, Kishiwada, Akira I. Kenji E, inventors; Shikibo Limited, Osaka , Japan assignee. Process for separating polysaccharides from Tamarind seeds. US patent. 4895938. 1990 Jan23. 20) Rao PS, Ghosh TP, Krishna S. Extraction and purification of Tamarind seed powder. J Sci Ind Res. 1946; 4: 705. 21) Baveja SK , Rangarao KV, Arora J. Examination of natural gums and mucialges as sustaining materials in tablet dosage forms. Indian J Pharm Sci. 1988; 80: 89-92. 22) Khanna M, Diwivedi AK, Singh S. Polyose from seed of Tamarindus Indica of unique property and immense pharmaceutical use. Trends Carbohydr Chem. 1997; 79-81. 23) Kulkarni D, Dwivedi AK , Singh S. Performance evaluation of Tamarind seed polyose as a binder in sustained release formulations of low drug loading. Indian J Pharm Sci. 1998; 60(1): 50-3. 24) Saetone MF, Burgalassi S, Giannaccini B, Bodrini E, Bianchini P, Luciani G. Ophthalmic solutions viscosified with Tamarind seed powder. PCT, Int Appl WO9728. 1997. 25) Kulkarni D. Dwivedi D. K., Sarin JP, Singh S. Tamarind seed polyose: A potential polysaccharide for sustained release of verapamil hydrochloride as a model drug. Indian J Pharm Sci. 1997; 59(1): 1-7. 26) Sumathi S, Alok R. Release behavior of drugs from tamarind seed polysaccharide tablets. J Pharm Pharmaceut Sci. 2002; 5(1): 12-18. 27) Emilia A, Arianna T, Paola D, et al. A mucoadhesive polymer extracted from Tamarind seed improves the intraocualr penetration and efficacy of Rufloxacin in Topical treatment at Experimental Bacterial Keratitis. Antimicro Agents Chem. 2004; 3396-3401. 28) Giriraj T, Kulkarni K, Gowthamarajan, et al. Development of Controlled release spheroids using natural polysaccharides as release modifier. Drug Delivery, 2005; 12: 201-206.